Results: For the first time, researchers have developed a comprehensive approach to look at aerosols—those fine particles found in pollution—and their effect on clouds and climate. Scientists from Pacific Northwest National Laboratory improved how aerosols are accounted for in a global climate model used to predict climate change by embedding a high-resolution model in each climate grid. The embedded model replaces parameterization, a simplified method currently used to reckon small-scale climate processes. The new integrated approach brings the small scale to the global scale, for more effective climate modeling. Why it matters: Advancing our ability to predict global climate change depends on accurate modeling of climate forces across all scales. Though current global circulation models, used to predict climate change, can represent large-scale atmospheric features (greater than 100 kilometers, or about 62 miles), smaller-scale processes can only be parameterized. But details in the smaller sizes are important to follow. Features such as clouds, aerosols, and pollution point sources can have a big impact on global climate. Accounting for small features, such as the effect of pollution aerosols on clouds, will help scientists better predict climate change to plan for a sustainable future. This study gives climate researchers a valuable tool for those important predictions. Methods: For this study, researchers from PNNL and the National Center for Atmospheric Research in Boulder, Colo., built PNNL-MMF, an extension of a multi-scale modeling framework that has been used since 2001. They embedded a cloud-resolving model (CRM) within each grid cell to specifically look at aerosol-cloud interactions for the first time. Using the cloud and aerosol properties statistics from the CRM, scientists can account for aerosol effects on clouds and clouds' effects on aerosols—the two facets of cloud-aerosol interaction. Unlike other models, the PNNL-MMF accounts for simulation of aerosol-cloud interactions in both stratiform and convective clouds on the global scale, using new mathematical formulas. Using this method, the team has simulated aerosol-cloud interactions that are consistent with observational data and conventional aerosol models. What's next: Now that researchers have developed the model and completed its preliminary testing, they are using the model to unravel the complex role that pollution aerosols play in a changing climate. Acknowledgments: This research was funded by the U.S. Department of Energy Atmospheric Radiation Measurement (ARM) Climate Research Facility, a U.S. Department of Energy scientific user facility; the NASA Interdisciplinary Science Program; the National Oceanic and Atmospheric Administration; and the National Science Foundation Science and Technology Center for Multiscale Modeling of Atmospheric Processes (CMMAP). The work was done by Minghuai Wang, Steven J. Ghan, Richard C. Easter Jr., Mikhail Ovchinnikov, Xiaohong Liu, Evgueni I. Kassianov, Yun Qian, and William I. Gustafson of PNNL; Vincent E. Larson and DP Schanen of the University of Wisconsin; M. Khairoutdinov of Stony Brook University; and H. Morrison of the National Center for Atmospheric Research, Boulder. Reference: Wang M, S Ghan, R Easter, M Ovchinnikov, X Liu, E Kassianov, Y Qian, WI Gustafson Jr., VE Larson, DP Schanen, M Khairoutdinov, and H Morrison. "The multi-scale aerosol-climate model PNNL-MMF: model description and evaluation," Geosci. Model Dev., 4, 137-168, doi: 10.5194/gmd-4-137-2011, 2011. To represent complex and small-scale systems in global climate models, scientists have used a technique that acts as a stand-in for the fine details. 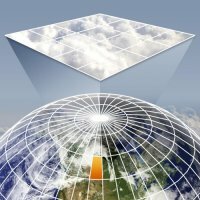 Grid spacing in global climate models is typically on the order of 100 kilometers—too coarse to account for important small-scale players such as cumulus clouds that can be less than one kilometer in size. Parameterizations are sets of formulas used to represent the effects of small-scale climate items and processes. Finding a way to replace parameterization will improve climate models and help us better predict climate change.